My assortment of 'radiance boosters' including serums, primers, glow creams and illuminating face powders...! Estee Lauder Advanced Night Repair (Synchronized Recovery Complex): Running out of my 3rd bottle of this was what prompted me to use up the various testers and trial sized products I’ve amassed. I really like this product, which is what prompted me to repurchase; I like the dark brown medicinal looking bottle and the pipette style dispenser and the amber colour and the thick, almost gel-like consistency of the serum…in fact I think all of these things combined to bewitch me a little, because the upshot is, I can’t say whether it made all that much of a difference to how my skin looks or feels. And so I decided to try out a few other variations before I invested again. Lancome Genifique Youth Activating Concentrate: I only had a teeny 7ml trial sized bottle of this thin, milky-white serum to test out, but I got about two week’s use out of it. Perhaps not long enough to notice any discernable difference, which could be why I wasn’t overly impressed. It didn't feel hydrating and in fact my skin felt a little irritated although this could have been any number of factors (I had, after all, just added about 3 additional steps to my skincare routine.) The bottom line is that I didn’t notice any particular improvements to my skin and, with its hefty price tag, I won’t be investing in this product. Perricone MD Advanced Face Firming Activator: With Alpha Lipoic Acid and DMAE, this light, white, sweet-scented lotion is intended to ‘correct imperfections for smooth, youthful, radiant skin’. I’ve been using it on my face and neck for just over a month now. While I haven’t been blown away by the results or noticed any massive improvements, my skin does feel nice and hydrated, which is a bonus for this time of year and the weather. This is a morning only treatment so I have been using it in conjunction with the Liz Earle product that follows. Liz Earle Superskin Concentrate: A 'night-time nourisher', this is a bright yellow blend of essential oils that smells naturally gorgeous -- very lavender-y, which it would, cos it's got this along with argan, rosehip, neroli and chamomile oils too. It left my skin feeling soft and smooth in the morning. However, I am not used to facial oils and on application I find this a tad, well, oily for my taste. My skin is also a little congested around my nose, which is unusual for me (it’s usually the chin that acts up) – but again, this could be down to any number of other factors as I have been changing things up a little on the skincare front. Ok, a lot. Espa Concept Intensive Bio Complex: This has a similar, natural, essential oil aroma to Liz's Superskin Concentrate, containing sweet almond, macadamia and tsubaki oils in a magnolia-coloured, lightweight serum, a texture I prefer to the oils alone. The Espa website tells me that it's intended for mature skin so I've taken the huff a little because, based very presumptuously on the grand total of three times that I've used it -- yesterday and today -- this seems to get on just fine with my fairly immature skin. (30 is the new 20, after all.) I will let you know if it acts to ‘revitalise, replenish and restore radiance’ to my skin once I’ve given it a fair old lash. 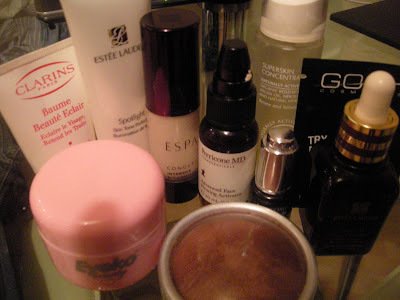 Coming up: primers, glow creams and illuminating finishing powders…the search for my 16-year-old face goes on. Oh, thank you! Unfortunately, as you're Anonymous, everyone is going to think I left that comment myself. But hey, I love my blog too, so what harm. I am thinking of getting meself YSL Palette Metallic Colorama Face Highlighter. Please say it's one of the ones you're going to review. @Jo, sadly, that's not one of the ones I have in my possession but it looks gorgeous and I'd say the colour will be lovely on you. I haven't actually tried out a rose-gold or pink-champagney type powder, more the bronzey and pale-goldy colours.